Glucosamine plays an important role in good joint health. 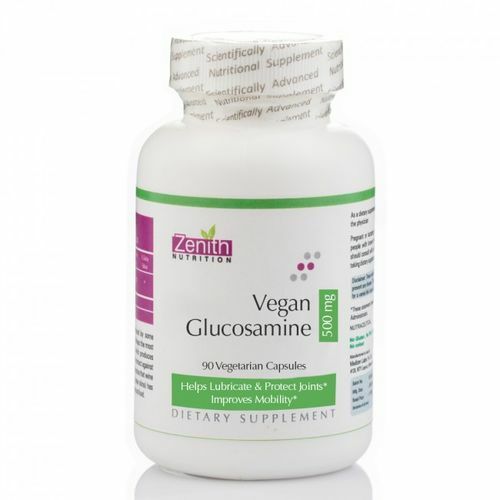 Glucosamine stimulates the biosynthesis (production) of some proteoglycans, restores damaged chondrocytes (cells of cartilage tissue), and has some antioxidant and anti-inflammatory abilities. The anti-inflammatory abilities of glucosamine are much less than NSAIDs and glucosamine is not known to have pain-killing abilities. It provides the building blocks for constructing cartilage. Zenith Nutrition's Vegan Glucosamine is perfect for senior citizens, weekend athletes, or anyone desiring extra nutritional support for cartilage and joints.